Many of our golf and gift items use domed ball markers, below are the colors available. Click image above for more information on the domed ball marker. 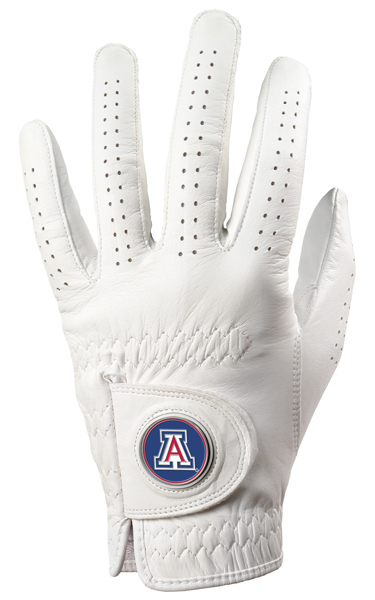 Our Golf Glove is made with quality, soft, durable Cabretta Leather for flexibility, strength and feel. Comfortable fit with reinforced seams, a moisture absorbent terry cotton wristband at the cuff plus a new 'twist' … a removable magnetic ball marker built into the wrist. The unique magnetic holder secures your favorite ball marker to the glove so it won’t fall or fly off when you swing. The middle section is the same diameter as a golf ball. By placing the spherical portion of the divot tool on top of a golf ball, it can be utilized to draw lines on the golf ball. This helps with both putting and driving alignment. The top handle portion has a magnetic front that securely holds a removable ball marker. The top part can be utilized as a club grip prop to keep club grips from getting wet. The 3 Ring Clip Key Chain can clip to any belt loop, golf bag or purse strap with its sturdy carabiner style clip. With a silver-tone plated finish and lightweight design, this key chain won't weigh your customers down. Also with 3 key rings they can put all their keys on this pocket size key chain with no worries! Tired of digging around in the bottom of your pockets to find a ball marker? Never lose your ball marker again thanks to our new mini magnetic golf ball marker clip! 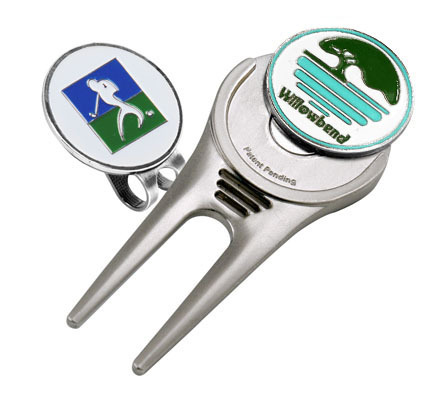 The nickel-plated clip securely grips onto any of our ball markers anywhere you want, keeping them easy to use and hard to lose! This unique all-metal clip combines maximum utility with a minimum foot-print. Our custom ball markers are metal-backed and proudly emblazoned with the logo of your choice on the front. A new spin on key chains! Our unique Spinner key chain features two identical enamel faux cloisonné images on both sides of the rotating central medallion. Made of sturdy solid metal, this two-tone key chain complementsany logo’s color scheme. Fun Tagz' sturdy alloy clip allows it to attach easily to any belt loop, golf bag, backpack or purse strap. Plus its ultimate light-weight makes it less cumbersome than traditional heavy metal key chains. This new light-weight alternative features a bright, eye-catching soft, color-coordinated plastic body with your logo. Our Heart Ornaments are made from a zinc alloy that is polished to a brilliant shine, with your customized coin permanently mounted in the center. They are packaged in white paperboard boxes with a clear plastic top, ready for gift giving. Each ornament also comes with a color-coordinated ribbon for hanging from almost anywhere. Although perfect for Valentine’s Day, they can be sold for any occasion, during any time of the year! Dimensions for the Heart Ornaments are 2.12in. x 2.04in. (54.1mm x 52mm). 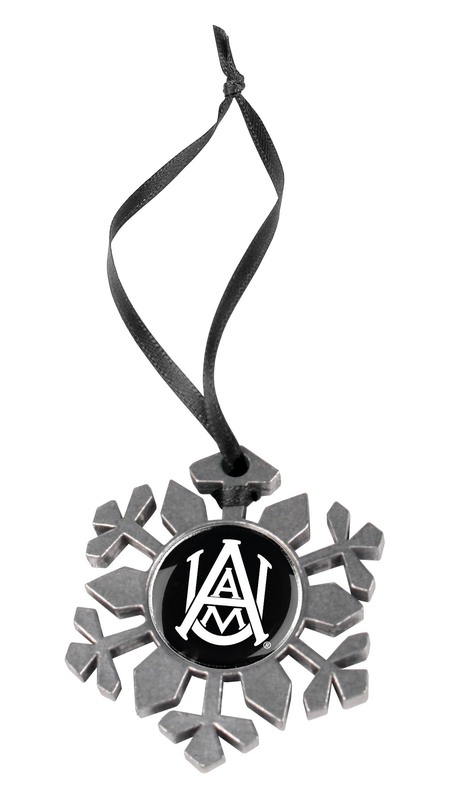 Made of pewter cast in the USA, each snowflake ornament has your logo medallion mounted in the center and comes with a color-coordinated ribbon for hanging. Perfect for all winter occasions, festivities and events. The snowflakes are 2 1/8 inches from point to point, and are 1/8 inch thick. The reverse sides are decorated with an eye-pleasing star-burst pattern. Give your customers a great way to celebrate with these unique holiday ornaments, showcasing their organization’s logo in a convenient, festively themed gift pack. Your customer is sure to love these dazzling ornaments in 4 holiday shapes including the star, tree, bell and holiday ball. They are made from a zinc alloy that is polished to a brilliant shine. Each ornament includes a color coordinated ribbon which allows hanging almost anywhere. The LinksWalker Mini Day Pack stores valuables and small items both on and off the golf course. Use the Mini Day Pack to keep things organized and easily transportable. Get the clutter out of your pockets and into a sporty pack. Available in Black and Pink. This desktop anti-stress ball is a perfect way to relieve tension at work. The golf ball textured rubber surface ball is filled with an elastic gel. When not in use, it rests on the golf club driver-styled base. The ‘face’ of the driver is permanently fitted with your custom ball marker. The base also handily holds a pen or pencil at the ready. 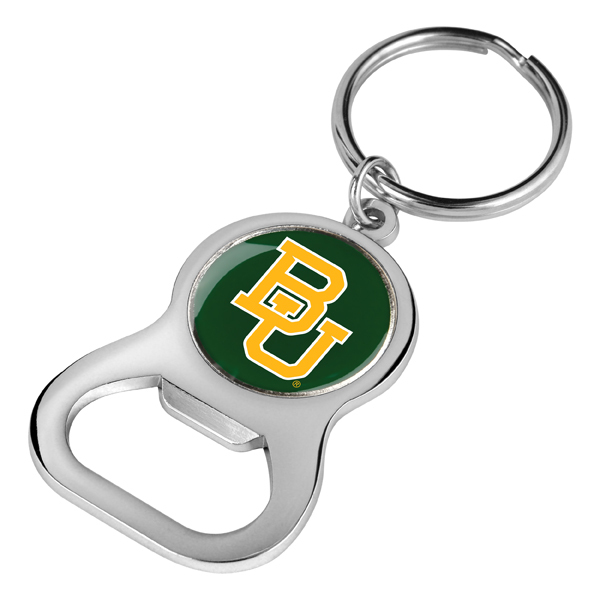 This durable, pocket-sized, full-metal bottle opener will attach to most key chains. Strong yet lightweight, it has a brilliant polished chrome finish. Securely embedded in the handle portion is a metal logo'd medallion! The keychain bottle opener is conveniently priced to make an excellent impulse buy or small gift. In these current economic times, it can be hard to keep your cash in hand. 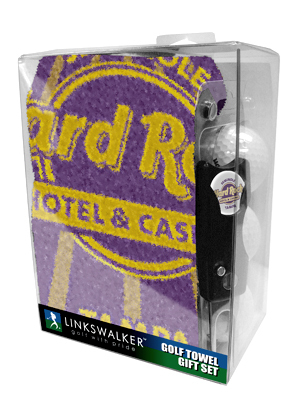 Now LinksWalker has made it easier to hold on to your money with the new LinksWalker Promotions Money Clip! Available in Silver and Gold finishes, these stylish clips will grip your greenbacks and keep them away from the tax collector! 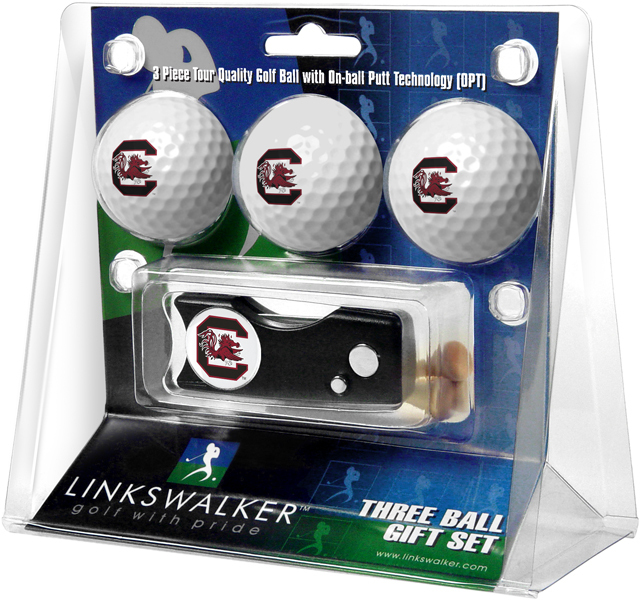 Our 1 Ball Gift Pack is perfect for sales call gifts, customer loyalty programs and (naturally) golf tournaments. Each pack includes one imprinted Top Flite golf ball and one domed ball marker in your choice of 9 colors. Customized insert cards are also available for an additional fee. Logo setup fee: Pad Print $45 (v), Die-Struck Ball Marker $65 (v), 6 week production time, price includes up to four colors. Coin Your Brand with our larger (45mm vs 38.5mm) Patented Customizable Challenge Coin/Super Ball Marker for greater brand impact. With our in house PAD Printing capabilities, you can now customize the receiver/ring portion of the coin, expanding your message and the possibilities…. Think Colors, Design Elements, Special Messages, Bleeds of Your Logo, and so much more! Each coin features two removable, die-struck metal inner coins/ball markers held onto the outer receiver with a heavy-duty magnet. Turn your ordinary ball marker into a commemorative coin! Our Challenge Coin features two removable, die-struck metal ball markers that are held onto the coin with a heavy-duty magnet. The coins sport a colored outer ring and are 1.5” in diameter, 3/16th of inch thick (.15") and weight 0.8oz (with coins). The substantial size and weight make it an ideal gift to celebrate special events, honor years of service and, of course, golf tournaments. All ring colors are available in both gold or silver tone receivers. Make a Bold Statement and reinforce your corporate logo or venue with our larger, more substantial, Patented Sports and Specialty Themed Challenge Coins/Super Ball Markers. These Coins feature two removable, die-struck metal inner coins/ball markers that are held onto the outer themed receiver with a heavy-duty magnet. They make ideal gifts, unique business cards, and collectables commemorating New Product Introductions, Anniversaries, Store Openings, Play-Off's, Tournaments and more. The Pocket Golf Ball Cleaner integrates portability with practicality. It boasts a unique, lightweight design that keeps the microfiber inner lining moist while the waterproof outer lining remains dry. Moisture and dirt are kept locked inside using a strong magnetic seal. The Pocket Ball Cleaner also comes with a removable domed ball marker that highlights your logo or event. Surprise your clients with this unique give-away that they’ll keep in their pockets for round after round of golf! 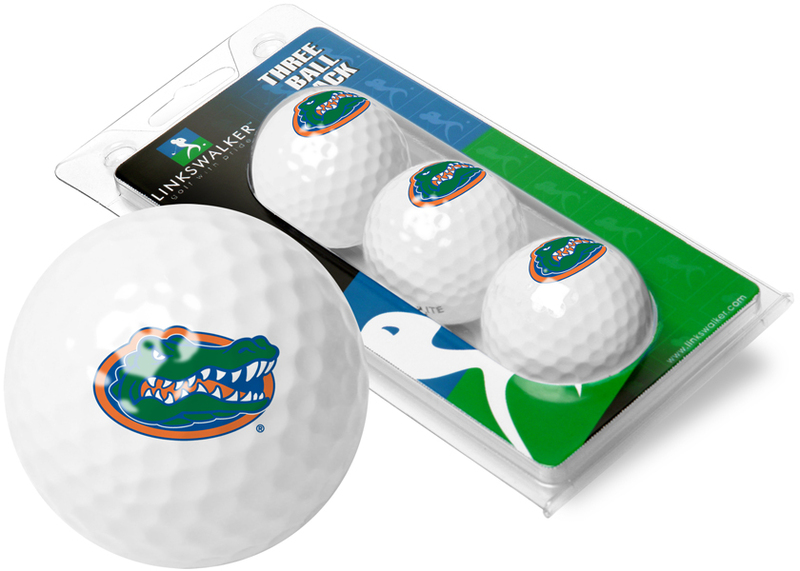 Dress up your imprinted golf balls with our 3 Ball Sleeves! All balls come handsomely pre-packaged in pop up packaging, ready for your event or tournament. Imprinted golf balls are also available in bulk and in 18 different colors. Call your representative for more information. Bulk up on Top Flite XL golf balls! Available in our standard white ball or 18 additional vibrant colors, see below. Choose from 9 vibrant colored backgrounds on this 24.5 mm domed ball marker. Your logo is imprinted on top of the epoxy dome to give it a 3-dimensional look. The back of this nickel-plated ball marker features a unique re-mark arrow to assist you in replacing your ball in the proper spot. Our Jacquard Golf Towel Gift Pack includes your premium, 100% cotton, made in USA towel, a Spring-Action Divot Tool, one ball marker and a 3 Golf Ball Sleeve in a clear plastic hang-or-stand gift box highlighting the towel logo. Your company logo or event title is woven right into this plush, premium, made in USA towel. This 16” x 24” towel features an ultra-absorbent terry looped cotton surface and a plastic swivel clip to attach easily to any golf bag. A dozen printed golf balls in a clear plastic clamshell. Available in our standard white ball or 18 additional vibrant colors see below. Three printed golf balls, four wood tees and one (your choice) of our divot tools with printed ball marker. Customized insert cards are available for an additional fee. *Hat Clip comes standard with LinksWalker logo. Tired of digging for your ball markers? Just slide your custom clip on your hat or belt and snap on your custom ball marker to the magnet. Never lose your ball marker again! Both clip and marker can be customized with up to 4 colors. *Die Charge for clip: $100 (v) 6 week production time, price includes up to four colors. *Die charge for marker: $65 (v) 6 week production time, price includes up to four colors. 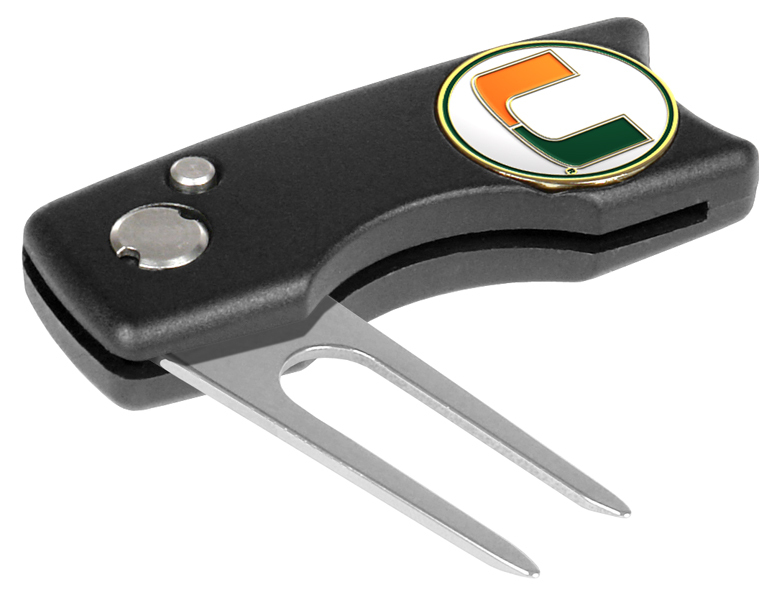 Impress your golf buddies with this switch blade action divot tool. Comes with a handy removable printed ball marker too. This combination divot tool and removable ball has a great solid feel. Clips to your belt or pocket for convenient use. An aluminum alloy divot tool that clips to your hat. Never lose your divot tool again! Also includes a removable die struck ball marker for the added touch of class.